N.W. corner of Monroe Street and Dearborn Street. The Chicago Fire gutted the building but the walls of the courthouse refused to fall. Nonetheless, the entire interior, along with most of the records and files were completely destroyed. The second Courthouse, Customhouse and Post Office was completed in 1880. The Federal Courthouse was housed in the building sitting on one square block bounded by Clark, Adams and Dearborn Streets and Jackson Boulevard. In 1891 the Everts Bill created the Court of Appeals for the Seventh Circuit. The court held its first session on June 16, 1891. Marred by poor planning and poor construction resulting in broken plumbing, crumbling plaster and flooding in various parts of the building, by 1892 this building was described as being in disgraceful condition and unfit for court business. The Monadnock Building, located at the corner of Jackson Boulevard and Dearborn Street, became temporary home to the Seventh Circuit Court of Appeals which remained here until April 15, 1905. The U.S. Courthouse, designed by architect Henry Ives Cobb, who also designed the Newberry Library, was renowned for its corona-topped dome. Congress mandated that the building fill the entire site to the lot lines. A hidden image of the face of Uncle Sam could be seen from the northwest corner of Adams and Dearborn Streets, looking southwest, at a certain time in the afternoon on a bright, sunny day. 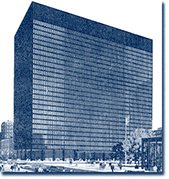 1212 Lake Shore Drive became the home of the United States Court of Appeals for the Seventh Circuit until 1965. Named after Senator Everett McKinley Dirksen, the present home of the Seventh Circuit Court of Appeals owes its design to principal architect Ludwig Mies Van Der Rohe. The block-long building rises thirty stories on a skeleton of structural steel, supported by concrete caissons extending to rock one hundred feet below sidewalk level. It is sheathed in a curtain wall of steel, aluminum and bronze-tinted glass. The entire ground level area is paved in granite, extending to the lobby as interior paving and onto the elevator core walls.